We are a manufacturer and fabricator of custom extruded silicone rubber profiles such as gaskets, seals and strips. 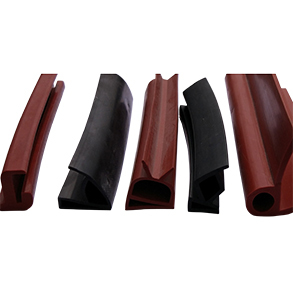 Our extruded rubber products includes; silicone tubing, rubber hose, platinum cured silicone tubing, fluorosilicone tubing, silicone rubber cord, conductive silicone rubber tubing, rubber extrusion, extruded rubber profiles, extruded gaskets, P-strips, D-strips, E-strips, conductive silicone extrusion, extruded and spliced gaskets, etc. We are also manufacturers and fabricators of food grade silicone tubing, surgical / medical purpose tubing and pharmaceutical tubing. In house mixing and tooling allows us to offer the fastest turn around and delivery flexibility. We are not just a manufacturer, we helped hundreds of customers to define their requirements and provided efficient design related help to solve their problems. We truly listen to your problems and provide cost effective solutions whenever needed.